Al-Ahliyya Amman University/Electronics and Communications Engineering Department, Jordan. 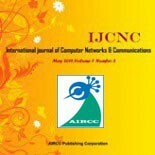 In this paper, an interference method based on signal processing is proposed. 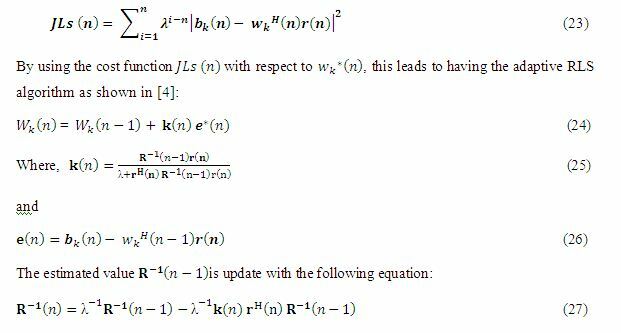 The approach is based on utilizing the maximum likelihood properties of the received signal. The approach is built on maximizing the probability of the desired data. The GPS data, which is constructed using Binary Phase Shift Keying (BPSK) modulation, is transmitted as “1’s” and as “0’s.” carried on 1575.42MHz carrier called the L1 frequency. The statistics of the GPS data and interference are utilized in terms of their distribution and variance. The statistics are used to update (adaptively) the forgetting factor (Lambda) of the Recursive Least Squares (RLS) filter. The proposed method is called Maximum Likelihood Variable Forgetting Factor (ML VFF). The adaptive update takes on assigning lambda to the maximum of the probabilities of the symbols based on the statistics mentioned. Global Positioning System GPS, Recursive Least Squares (RLS) algorithm, Forgetting Factor (λ), interference, OTA carrier. Interference, nowadays, is evident in many areas especially in wireless communications. This interference is paramount when the signal level of the victim receiver is very weak. The GPS receiver in smart phone mobile handset is such an example. Inside the smart phone, the GPS, with its weak received signal, is subjected to high levels of interference from the transmitters of other services, such as the over the air interface, that have high-transmitted powers. Mobile handsets are compacted with a variety of services. Some of these services are dependent on carrier frequencies to relay the information (message). Some of these services are on the receiving end while others are both transmitting and receiving. An example of the former is the GPS service where there is only a GPS receiver in the mobile handset. An example of the latter is the over the air (OTA) interface services that follow a (3G) or (4G) standard specifications; an example of which are the (GSM) and (WCDMA OTA) services. All of these services co exist inside the mobile handset within a close proximity of one another to the point where there is not enough power (path loss of (OTA) transmitted power) isolation between them. Another issue is the close proximity in frequency spectrum between some of the bands of the (OTA) transmitters to that of the GPS receiver band. Therefore, there are spatial issues as well as spectral issues the GPS service has to suffer from. In addition to that, the weak GPS signal that arrives at the GPS receiver is of greater magnitudes lower than that of the (OTA) transmitted power. The above leads to the (OTA) service interfering with the GPS service. The interference could be in the form of disabling the front end, corrupting the demodulated data and therefore high symbol error rate, or both. The conclusion is lack of GPS coordinates or erroneous ones. Adaptive filtering is used to mitigate the effect of interference and multipath occurring to the desired signal. It is divided into two types; linear and non-linear. 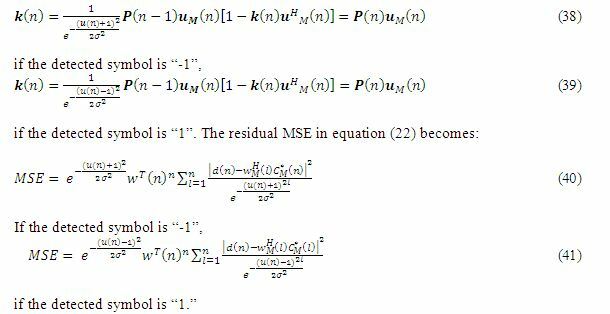 Recursive Least Squares (RLS) is one of the adaptive linear filtering methods that rely on previous received data to achieve the best estimate. 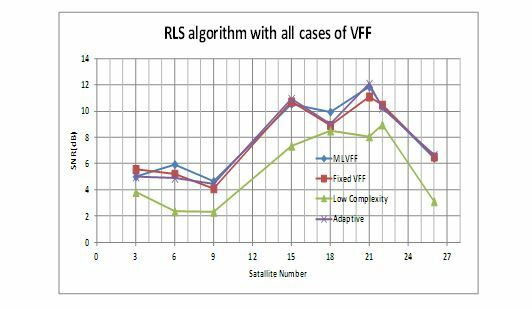 In this paper, an adaptive RLS based on maximum likelihood variable forgetting factor ML VFF is employed to mitigate the effect of interference. The paper is organized as follows: section II goes over some of the theory, background and derivation of the VFF RLS in terms of non adaptive and adaptive methods. First, the non adaptive method is covered and it is called fixed VFF. Next, the adaptive VFF, which is also called gradient, based adaptive VFF. Then, the low complexity VFF is covered. Section 2 also features the proposed algorithm, which is the ML VFF. Section 3 goes over the results and lastly section 4 discusses the conclusion. Where, , n= 1, 2… i. The exponential forgetti data from distant past. (λ) is also a measure of memory where ( λ =1), indicates infinite memory. Since (λ) tries to track the statistical variations of the observed data , it would be instructive to take into account the probability distribution of the desired data as an updating parameter. Since the GPS data are non-stationary random process, the adaptation and tuning of the estimation process is carried out by tracking the statistical properties of the GPS data and interference.The exponential forgetting factor (λ) is a weighting factor intended to discard the data from distant past. (λ) is also a measure of memory where ( λ =1), indicates infinite memory. Since (λ) tries to track the statistical variations of the observed data , it would be instructive to take into account the probability distribution of the desired data as an updating parameter. Since the GPS data are non-stationary random process, the adaptation and tuning of the estimation process is carried out by tracking the statistical properties of the GPS data and interference. By estimating the initial value of and the adaptive algorithm begins its work with the training mode, then it switches to the decision directed mode by implementing by using equations (24) – (27) . Results were obtained for the signal to noise ratio of select satellites to show the improvements made by using the statistical decision theory based variable forgetting factor, λ, for a certain interferer level. Figure 2 Shows a summary and comparison of the results of the four cases of (RLS) algorithm based on variable forgetting factor λ (fixed, adaptive, low complexity, ML). The value of λ must be in range. In this paper the value of λ being used is 1 for the fixed VFF case. The results are shown in terms of the S/N ratio vs. satellite Space Vehicle Numbers (SVNs) 3, 6, 9, 15, 18, 21, 22, and 26. The reason these satellites were selected is their signal levels represent a detected signal based on some threshold. This threshold is determined by the statistics of the residaul noise variance. While three of these cases show close results, the (low complexity VFF) has the definite inferiority. Table I, shows another summary. This time is in terms of the average of the S/N for each case. Figure 2. S/N vs. Satellite SVN for a select number of satellites showing improvements in Signal to noise ratio in dB using RLS algorithm based on all cases of variable forgetting factor, λ, for a certain interferer level. Figure 3. 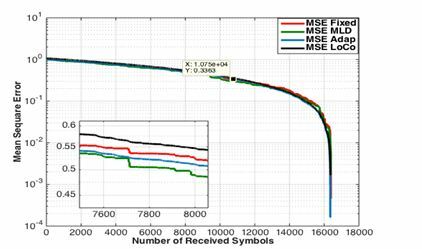 Analytical MSE for the RLS algorithm based on fixed, adaptive, low complexity and ML VFF. 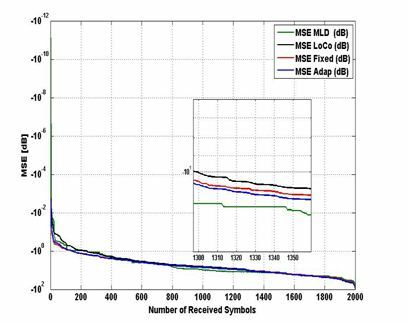 Figure 4.Analytical MSE for the RLS algorithm based on Fixed, Adaptive, Low Complexity and ML VFF. A novel algorithm to combat interference to GPS has been proposed. This algorithm allows the GPS receiver to operate with other Smartphone services, simultaneously, without degrading or compromising performance. This algorithm is based on utilizing the tuning of the forgetting factor of the RLS estimation versus time. The tuning is based on assigning the time variable forgetting factor to the maximum likelihood probabilities of the corrupted GPS received signal. The results show this novel algorithm is both superior to and with less complexity than other algorithms discussed in this paper. This is evident from both figures 2 and 4 and Table I.
 L. Weifeng, and J. C. Principe, and S. Haykin. “Kernel Adaptive Filtering.” , 1st ed., vol. 12. Wiley & Sons Publishing Co. Canada, 2010,pp. 155-160. S. Haykin, “Adaptive Filter Theory”, 5rd ed., vol. 10. S. Haykin, “Adaptive Filter Theory”, 4rd ed., vol. 10. Englewood Cliffs, NJ:Prentice-Hall, 2002, pp.244-248. C. Yunlong, and R. C. Lamare, “Low-complexity Variable Forgetting Factor Mechanism for RLS Algorithms in Interference Mitigation Applications.” International Symposium on Wireless Communication Systems (ISWCS). china, vol. 2, 2012, pp.471-475. S. S. wook, and J. Lim, and S. J. Baek, and K. M. Sung, “Variable Forgetting Factor Linear Least Squares Algorithm for Frequency Selective Fading Channel Estimation.” IEEE Trans. Veh. Technol. IEEE Transactions on Vehicular Technology. Japan, vol. 53, 2002, pp. 613-616. Taher AlSharabati obtained his BSEE from St. Cloud State University in 1993, his MSEE from the University of Toledo in 1996, and his PhD in Electrical Engineering from the University of South Carolina in 2012. Between his MSEE and PhD, he worked in the industry for many years during which he worked at Motorola Inc. for about nine years. Currently, he is an assistant professor at Al Ahliyya Amman University in the Electronics and Communications Engineering department.